OCEAN VIEW 3 BR/2 BA - 45 Yard Walk to Beach! You will enjoy the beautiful and quiet family atmosphere this villa offers. The beach is a short 50 yard walk through a lush grassy courtyard. This villa is ground-level which makes toting beach chairs, coolers, etc. to the beach a breeze. Our villa has been complete renovated with new flooring, new kitchen and new furniture. Upgrades have been made in 2011 to include a new HVAC system, new refrigerator, all windows replaced and complete repainting. In 2014, both bathrooms were renovated and hardwood flooring was added throughout. This Non-Smoking villa has a living room with a two sofas and a TV and VCR/DVD for your entertainment. The master bedroom has a king-size bed and cable TV. The second bedroom contains two full-size beds and cable TV. All TVs are flat screen and have a VCR/DVD player connected to each. The third bedroom contains two twin-size beds. Linens are provided. A full kitchen, including all cookware, dishes, and glassware, along with a microwave and refrigerator, with an ice maker, and oven/stove is provided. Also, a washer and dryer are located inside the villa for your convenience. A stainless steel gas grill is provided on the patio. We also have WIRELESS INTERNET service from inside the condo! Fripp Island Resort's policy on Fripp Club amenity cards for 2014/2015 allows our guests to use the tennis facilities, the golf courses, the pools, rent golf carts and water crafts and use the restaurants on the island. Each guest over the age of 12 must purchase and have in their possession an amenity card to use the resort facilities. As property owners, we must pay full membership fees to the Resort to enable our guests to purchase amenity cards. The cost for guest amenity cards, for 2014/2015, is as follows: Memorial Day-Labor Day: $50.00/person (4-7 day), $35.00/person (1-4 day); Fall, Winter and Spring: $35.00/person (4-7 day), $25.00/person (1-4 day). We include two complimentary amenity cards for 7 night rentals, but, if additional amenity cards are needed for your party, they must be paid for at the time you send your rental agreement and reservation deposit. We will reserve these cards for you and our Fripp Club account will be charged for the cards you pick up. If you purchase additional cards, but, do not pick up your cards, please let us know and we will refund the fee to you. We are not charged for cards that are not picked up. Guests do not have to buy amenity cards! You can enjoy the beach, the bike paths and the shops without an amenity card. There are many wonderful restaurants, golf courses, bike rentals, golf cart rentals and tennis courts off of the island. Please check with us or the Beaufort, South Carolina Chamber of Commerce for more information. Our central location puts guests with amenity cards within walking distance of the Olympic pool with baby pool,the adults only pool with walk up bar, a fitness center, Little Dipper food court (Starbuck's coffee, Breyer's ice cream, pizza, Mexican food, salads, fruit, sandwiches), fine dining at The Beach Club Restaurant, and the Racquet Club's ten tennis courts. Ocean Point and Ocean Creek Golf Courses, on the island, are challenging and beautiful and are less than five minutes from the condo. Fripp offers a full-service marina complex, located less than five minutes from the villa, providing launching, docking, boat rental, and the Marina Store. Rental golf carts, mopeds, bicycles, wave runners, and kayaks are also available. The Bonito Boathouse has family dining with wonderful sunset views across the marina. The Cabana Club at Veranda Beach, also located less than five minutes from the villa, has three pools (great kiddie pool with fountain and slide, heated pool and a lagoon pool), Sandals Bar and Grill, and Wet Willie's Bar. Camp Fripp offers daily summertime children's activities for ages 3 through 12. Additional nature and social programs can be scheduled for the entire family. Davis Love Park has a brand new playground, basketball court, and volleyball courts. Fripp Island has a wonderful off-road bicycle path where you and your family can enjoy viewing an abundance of deer, low country birds, and other wildlife. Fripp is a protected wildlife refuge which contains an abundance of many beautiful animals. Most traffic on Fripp Island is by golf cart which allows you to enjoy a slow-paced quiet atmosphere for a completely relaxed vacation. For your safety and protection, there is a 24-hour security gate as well as police, fire, and paramedic services on the Island. All you will need for a wonderful beach vacation, at this villa, are your beach chairs and towels!! We are Jim, Lee and Breland Foster from Greenville, South Carolina. Our daughter, Breland, had her first beach experience on Fripp at the age of 18 months. Lee first started visiting Fripp, when she was 8 years old, on vacations with her family. The island was much less established during that time to the degree that she remembers riding horses on the beach with her sister and cousins! Since that time, Lee has visited, on occasion, with college friends from Furman. Jim also began visiting Fripp earlier in his life, during his college years at USC, and afterwards in his young adult years. Fripp has been a part of our lives for a long time and we hope it continues to bring us peace and to nurture our souls! We chose Fripp Island as our vacation home location because it is a beautiful low country setting that has a natural, quiet, noncommercial and unhurried atmosphere. We love the uncrowded and quiet beach the most. It is also fascinating to watch the beach change throughout the seasons and years because, as a barrier island, it changes frequently! We also enjoy the beautiful golf courses, the naturalist programs and the other amenities the Club offers. Most of all, we have a lot of fun with our 'Fripp Friends', who are families that also own condos in our complex, from Columbia, SC, Atlanta, Ga, Laurens, SC, Greenville, SC, Ohio, etc. that we only see at Fripp when we happen to be visiting at the same time! We chose to buy a condo in Phase III of the Capt. John Fripp villas because it is practically beach front and provides a beautiful courtyard where our daughter can play with friends and we can visit old friends and new! We recently (2012) bought another condo in this complex that is an oceanfront 4BR/4BA unit (VRBO #398399). 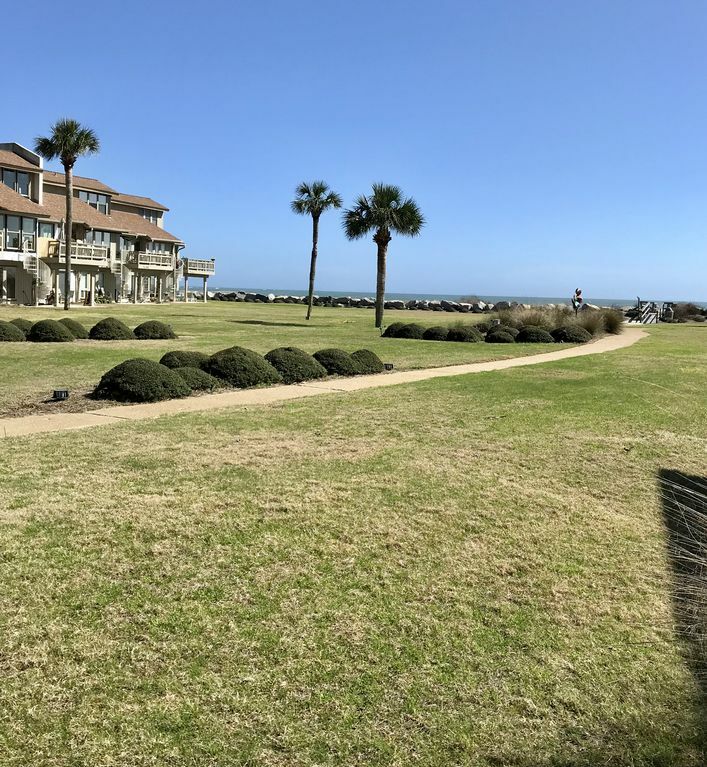 We also like the centralized location and walking distance access to the Tennis Club, the Beach Club, the Olympic Pool, the Fitness Center, the Adult Pool, the Sandbar, the Food Court and to the Fripp Ship! Our condo is a leisurely 50 yard walk through a grassy courtyard to the beach. One set of washcloth, hand towel and bath towel provided for 6 guests. No beach towels available. Have rented for many years. The condo is lovely. Thank you, Pat! We appreciate being a part of your family vacation every summer. This condo is comfortable, neat, roomy, close to the beach, and on ground level if you have stair issues. The owners have it well stocked with supplies upon arrival and instructions are very clear for all rental needs. It’s a quiet, relaxing area and we cannot wait to come back! Thanks Jim and Lee! We loved CJFV 113! The villa is clean and updated. The location is awesome. We hope to stay here again next year. Thank you, Kim! We look forward to having you back next year. We had a wonderful stay in Fripp. The condo is nicely furnished with all of the amenities that you will need for a great week at the beach. We love the location which gives you a great view of the beach and a large grassy area for the children to play. We will be renting from Lee again. We loved our week vacation at this condo and plan to rent it again next year! The furniture is nice, comfortable beds. Lee Foster is so wonderful to work with and was so responsive and helpful to be sure our vacation was a success! I highly recommend this property! Great central location next to beach club. Very nicely maintained, owners are extremely reasonable and are very clear about the mechanics and expectations of how things work (getting guest passes, parking, tips for checkout and maintaining property), so be sure to read everything they provide as it makes staying there very easy. You can see the Atlantic from the unit and their patio, which includes a well maintained gas grill. Two large bedrooms with connected full bathrooms, each with their own TVs to have some evening separation for kids or other adult guests. Third bedroom is off the living room and works well for kids. Kitchen has exactly what you'd expect in your own vacation home; we were able to cook all week which gives you extra time to enjoy the Island's activities rather than trying to eat out all the time (which is limited on the island anyway). We had four adults and one preschooler, and there was more than enough room for everyone to have their own space during downtime from the beach and pools. We would stay here any time and would highly recommend to anyone looking for a Fripp vacation. Do yourself a favor and rent a golf cart, it's well worth the $300. Weekly rates include all taxes/fees/housekeeping and 2 complimentary amenity cards. Stays of less that 7 nights require an additional charge of $150 for housekeeping and no complimentary amenity cards. However, amenity cards may be purchased through owners. Rates are subject to change until reservation is confirmed. Full refund if cancellation made at least 60 days prior to arrival. PAYMENT BY CREDIT CARD - ADD 5% HOME AWAY TRANSACTION FEE TO TOTAL.